Is the ag-tech boom ripe for Australian investors? Industrial agriculture provides food for millions, if not billions, of people across the globe — but this is an industry that is facing serious and well-publicised challenges. Food demand is set to soar with the world’s population projected to reach an estimated 9.7 billion by 2050. A new generation of middle-class consumers are set to upgrade their diets, including increased consumption of meat (which is grain-intensive). In addition, declining arable land and salinity issues, and problems with water access, as well as pest and disease problems, are keeping farmers on their toes — at least, those who haven’t yet been forced out of the industry altogether. Where there’s a problem, however, there’s an opportunity, which is why we’re seeing the rapid expansion of what’s known as ag-tech — digital technologies made specifically for the agricultural industry. These ag-tech plays (listed and unlisted) are popping up at a rapid pace, looking to provide farmers with the tools, data and knowledge to make better informed and timely decisions to improve productivity, sustainability and profitability — and cut waste. Through the disruptive forces of ag-tech, it is predicted that agriculture will turn into a $100 billion industry in Australia by 2030 according to research commissioned last year by tech accelerator StartupAUS. In March this year the Victorian Government provided details of Internet of Things (IoT) trials in the agricultural industry, as part of a $12 million funding program announced in the 2016-17 budget. It added that it would provide a further $15 million to Victorian farmers to go towards installation of IoT and other digital technologies on farms. In the same month, Malcolm Turnbull launched Talking 2030: Growing agriculture into a $100 billion industry, a ‘discussion paper’ created alongside KPMG and the National Farmer’s Federation (NFF) to amplify Australia’s farm production via ag-tech. The paper explores ways to accelerate the growth of Australian agriculture to achieve the NFF’s vision of AU$100 billion in farm gate output by 2030. Ag-tech often intersects with fields like biotech, genetech, foodtech and food commerce — all critical components of the one integrated value chain. More than US$700 million was invested in ag-tech companies in 2017, on track to beat the previous two years combined according to research firm CB Insights. However, if you are contemplating in an investment in a listed ag-tech company, keep in mind that they are speculative and you should seek professional financial advice for further information. The global ag-tech opportunity, moreover, could reach US$189 billion (A$239 billion) in the next five years, fuelled by US$1.5 billion in venture capital investment, according to StartupAUS. The demographic issue is particularly relevant. The major increase in global population means that by 2050, agriculture will have to produce almost 50% more than what it produced in 2012 to feed everyone, according to The Food and Agriculture Organization of the United Nations (FAO). A swathe of ag-tech companies have cropped up in the last 6-12 months, and as more and more new plays arrive on the scene, we are seeing some obvious themes. What’s most novel and interesting in the world of ag-tech now is not so much the range of problems looking to be solved — as many of these issues tend to be as old as the industry itself — but rather the fascinating technological solutions being proposed. 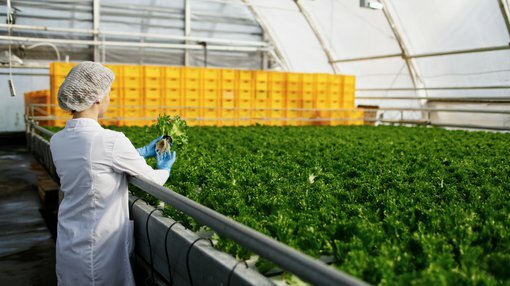 Through ag-tech, farmers are now gaining access to farm management software sensors and Internet of Things (IoT) technology; controlled agriculture (that’s where vertical farming, hydroponics, aquaponics and smart indoor farms come into play); robotics and automation; bioenergy and biomaterials; and food technology. There’s also the automation of global trade compliance, water management via IoT networks, and digital supply chains that connect consumers and producers using blockchain technology. Take vertical farming, as an example. Right now the world’s largest vertical hydroponics farm is being built in Dubai — right on the runway that serves Emirates airline. That’s no coincidence. The 50-foot-high ‘sealed warehouse’ will be used to produce three tonnes of leafy greens a day to feed the airline’s passengers; specifically, the 225,000 meals Emirates caterers produce daily for in-flight meals. Another area of development in ag-tech is the use of drones. In June, the US-based ‘agricultural intelligence company’ Agribotix announced a new plant count report with advanced analytics. The report allows the user to obtain a quantitative measure of the number of plants across their whole field — via the use of drone technology — as well as a map of areas of average, above and below average plant count within a field. But it’s not just crops and plants — fish farms have been a focus of attention too. The cleverly-named Aquabyte, designed in Silicon Valley and made in Norway, uses AI software in fish farming to monitor food consumption to minimise waste and save money. The company raised US$3.5 million through a list of investors which includes Princeton University. Blockchain technology is also set to change everything. Australian agricultural software producer AgriDigital has built a private blockchain for supply chain finance in the world of agriculture. Over 1.6 million tonnes of grain has already been transacted over the cloud-based system, amounting to $360 million in grower payments. Roots Sustainable Agricultural Technologies is an ag-tech small cap whose two patent protected technologies, Root Zone Temperature Optimisation (RZTO) and Irrigation by Condensation (IBC), are addressing critical problems faced by the agricultural community. ROO develops and commercialises technologies that directly address critical challenges faced by modern agriculture — including water shortages, food production security, extreme weather conditions and climate change. It’s RZTO technology is the only two-in-one, low energy, root zone heating and cooling system on the market. Its unique mechanisms have been applied in a range of pilot and commercialised plants in several countries. In collaboration with Teshuva Agricultural Projects (TAP), the company has made an advanced, hydroponic, nutrient temperature-controlled greenhouse based on its RZTO technology. It unveiled the greenhouse in May at one of the world's leading agriculture exhibitions, Agri-Tech Israel 2018. ROO has also recently taken its tech to the buzzing medical cannabis space, conducting a pilot using its RZTO technology alongside American Farms Consulting LLC (AFC) in Washington. It also sealed a deal to use RZTO to conduct a world-first ‘proof of concept’ to cool medicinal cannabis roots grown in a greenhouse in northern Israel. Of course ROO is still in the early stages of its research and development, so investors should seek professional financial advice if considering this stock for their portfolio. Roto-Gro International is a Canadian cannabis-tech company, dual-listed on both the ASX and the Frankfurt stock exchange, which has created an automated rotary hydroponic vertical farming system for producing consistent quality plants indoors. Its technology uses less space and energy than a traditional hydroponic environment. RGI’s aptly named Model 420 System reduces the costs associated with conventional hydroponics including facility construction and maintenance costs; utility costs; atmospheric, water and nutrient costs; and pest/disease control costs. RGI’s system results in 10 times the production of traditional flatbed growing in the same amount of floor area, using 40% less electricity. The patented tech is able to produce uniform, high-quality medicinal cannabis at a lower cost — and there’s also considerable upside in terms of its application in health and nutrition supplements, herbs and spices, pharmaceuticals, nutraceuticals and food products. RGI is capped at a modest $35 million, but it’s moving quickly – it recently inked a binding letter of intent (LOI) with organic perishable foods grower, Gibio Inc., and scored a $2.3 million order from Miracle Valley Medical Alternatives M.V.M.A. Ltd., a Health Canada licensed producer. Is Australia in prime position to reap and sow? While we are a ‘sunburnt country’ — 35% of Australia receives so little rainfall, it is classified as desert — we do produce a lot of farm exports. In 2010-11, approximately 53% of Australia's total land area was being used for agriculture. The gross value of Australian farm production in 2016-17 was A$60 billion. Australian farmers export about 77% of what they grow and produce — and on that front, as a country we are well placed with a strong path into Asian markets like China. Take into account our accumulated generational farming knowledge, high-quality tertiary research in agriculture, and established export channels and there’s plenty to recommend Australia as a potential hub for this burgeoning industry. Add in the current momentum in our start-up and entrepreneurial ecosystems, and it’s not hard to see how the blossoming of ag-tech industry could mean major business opportunities for anyone entering the field (literally or figuratively) in Australia.